From comedy to drama, romance to classic, independent to thriller - movies, movies, and more movies await on the iTunes Store. Browse thousands of releases from every major Hollywood studio. Buy or rent them in standard or high definition. With just a click, they'll download to your computer, iPhone, iPod touch, or television via Apple TV. When you buy select movies, you'll discover a world of special features called iTunes Extras - you can watch interviews and trailers, view photos, and more in your iTunes library on your Mac or PC. You rent movies from iTunes Store. Do you know limitations about these movies? You can only play the iTunes rent movies on one device. These M4V movies are protected by DRM protection. You could NOT play them on your own mobile devices other than Apple devices. If you want to play these rent videos or movies, you need to remove the DRM protection from M4V. Well then, you have to use a M4V converter. Here, you can see a powerful tool, called M4V Converter Plus. To remove DRM protection, M4V Converter Plus is your best choice. This M4V converter software supports batch conversion. You can add batch of videos to the software and convert them to single format. The software can convert them one by one. M4V Converter Plus is a professional M4V video converter. It converts almost all video formats could be played on your iTunes, includes DRM M4V your purchased. Convert any M4V format to unprotected MOV, MP4 format. It supports to convert iTunes M4V rentals. If your iTunes can play the M4V rentals, M4V Convert Plus will convert iTunes M4V rentas for you. You can convert m4v video to MP4 as the same quality. You can also select to convert M4V for iPod, iPhone, Apple TV, PSP, Zune, etc. After conversion, you can play the video on the software. Step 1: Free download M4V Converter Plus, install and launch it. Click "Add Movies" in the main interface. 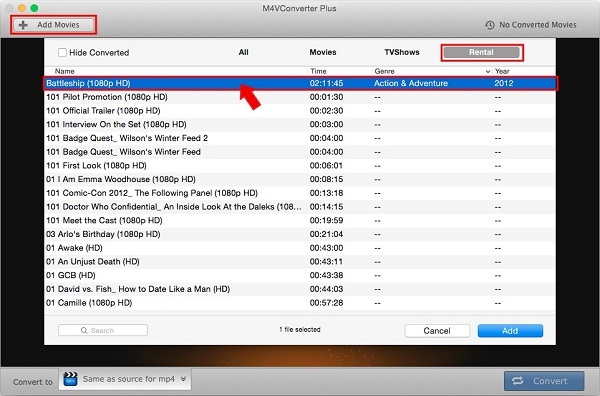 Add the M4V video files you rented from the iTunes. You can add many videos to the software, and M4V Converter Plus will do batch conversion for you. Step 3: Click "Convert to" profile to choose format you want to get. You can see M4V Converter Plus supports various formats such as MP4, MOV, AVI, WMV, MP3, etc. Step 4: Finally, click the button "Convert" to start converting iTunes movie rentals. Few seconds later, you can complete the conversion.